The hosts may have a 5-9 record heading into this Friday night Euroleague game but they have managed to win their two most recent games. This will give them some confidence but they face a Greek side that has managed to win four games in a row and Panathinaikos hold a 9-5 record. 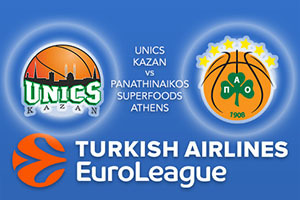 However, they have only won two, while losing four, on the road so this won’t be a simple game for Panathinaikos. The two sides have only clashed on two occasions in the Euroleague before, playing two games in the Top 16 of the 2011/12 season. Both side has won a game each so whoever takes a victory from Friday night will also take the lead in the series. One thing that Unics Kazan have in their favour is the top scorer in the league. Keith Langford has provided an average of 23.9 points per game so far this season and the home fans will be looking towards Langford to lift their spirits and drive them on to victory. Quino Colom will be another player who can have an impact on the game and he has provided an average of 10.9 points per game so far this season. Panathinaikos have been leaning heavily on Nick Calathes so far this season and he has provided an average of 13.6 points per game, an average of 5.2 rebounds per game and an average of 6.9 assists per game. This is a tremendous return and if the away side come out on top in this game, it is likely that Calathes will have played a big part in their success. However, there are other players in the Greek side who can have a big impact including Chris Singleton, with an average of 11.9 points per game and KC Rivers, who has chipped in with an average of 10.8 points per game. The Greeks have a strong defence and this should help on Friday night. The bookies think it will be close so take Panathinaikos Athens Superfoods at -1.5 at odds of 1.90. For the Over/Under market, go UNDER 157.5 at odds of 1.90. Bet Now!